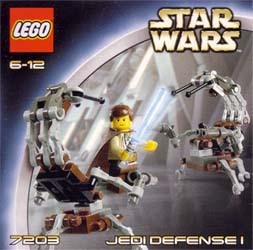 The Star Wars Lego kit "Jedi Defense I" might be small, but it comes equipped with everything you need to recreate your own Star Wars: Episode I battle scene. The kit contains Obi-Wan Kenobi (complete with blue lightsabre) and two menacing looking destroyer droids. While some might argue that it is a little expensive for what you get (and I suppose that in all honesty it is), there's still no arguing that it is a quality release. As long as you've got more Lego, you can build your own play area, as well as additional hostile threats for your hero to overcome. As with the rest of the kits in this series, they are just a little too pricey, but to be honest what else can you buy these days with the same money? Console games cost an arm and a leg and rot your children's brains (apparently). If you want them to play in the same way as we did when we were young, then buying these is a good start. This release will appeal to Star Wars fanatics out there too. Another cracking Lego release.